The Victorian Government will adopt the Proust Model for public sector integrity, including the establishment of a Victorian Integrity and Anti-Corruption Commission (VIACC) as the next step in greater accountability in Government, the Premier, John Brumby, announced today. Releasing the report today, Mr Brumby thanked Special Commissioner Elizabeth Proust and Public Sector Standards Commissioner Peter Allen for their Review of Victoria’s Integrity and Anti-Corruption System, which has acknowledged the strengths of existing integrity agencies, but identified gaps in current arrangements. “The Proust Model provides a commonsense roadmap, which proposes new arrangements for greater coverage, and provides better coordination and oversight,” Mr Brumby said. “Our Government has time and again taken tough decisions to drive greater accountability and attack the causes of maladministration, misconduct and corruption in public administration. “The former Premier, Steve Bracks, significantly improved on the public sector accountability measures he inherited. On coming to Government, he restored the independence of the Auditor General, the Ombudsman and the Director of Public Prosecutions, reformed freedom of information and established a whistleblower protection regime. “In 2004, Mr Bracks established the Office of Police Integrity and significantly increased the powers and resources of the Victorian Ombudsman. Modernising the Ombudsman Act 1973 to provide further clarity around the Ombudsman’s procedures and jurisdiction. Under the Proust Model, the new VIACC and the other integrity bodies will be part of an Integrity Coordination Board to strengthen coordination, cooperation and information sharing across the integrity system. 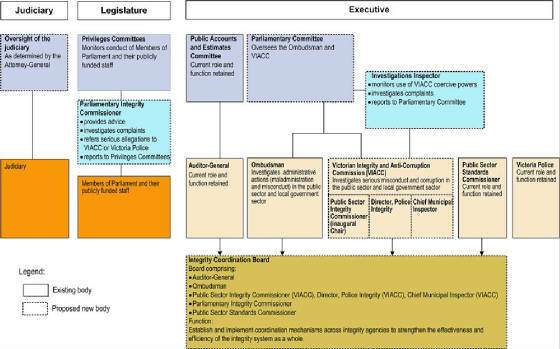 The Integrity Coordination Board will be established in legislation and comprise of the Ombudsman, the Auditor General, the Public Sector Integrity Commissioner, the Director Police Integrity, the Chief Municipal Inspector, the Parliamentary Integrity Commissioner, the Public Sector Standards Commissioner. A new all-party Parliamentary Committee will monitor the powers and functions of the VIACC. A new Investigations Inspector will absorb the roles of the Special Investigations Monitor and will audit the operations of the VIACC and monitor the use of coercive powers. Mr Brumby said the Deputy Premier and Attorney-General, Rob Hulls, would take carriage within Cabinet of implementing the reforms – with Public Sector Standards Commissioner Peter Allen to determine and oversee the implementation plan. “Our Government is proud of its record of increasing openness and transparency in public administration in Victoria, and these reforms are the next step in our work,” Mr Brumby said. Mr Hulls said the Proust review coincided with action the Brumby Labor Government was taking to increase transparency and accountability in Victoria’s justice system. “This year we will introduce legislation into the Parliament to create a new Judicial Commission of Victoria, delivering on our commitment in Justice Statement 2 to review arrangements for handling complaints against judicial misconduct and unprofessional behaviour,” Mr Hulls said. Mr Hulls said that while many of the reforms required complex changes to laws, the Brumby Labor Government would move immediately on legislation to establish a Parliamentary Integrity Commissioner. “I will also work with Mr Allen to draw up an implementation plan to deal with the complicated Constitutional and legislative matters underpinning these reforms, as well as establishing appropriate interim measures,” Mr Hulls said. Mr Hulls said the transition to the Proust Model would provide for the continued operation of the Local Government Inspectorate and Compliance Inspectorate, the Office of Police Integrity, the Special Investigations Monitor and the Ombudsman. Restored and entrenched the powers of Victoria’s key independent watchdogs – the Ombudsman, Auditor-General and Director of Public Prosecutions. Established a regime to protect whistleblowers who expose public officials engaging in improper conduct. Removed the gag from public servants and established the State Services Authority to oversee good governance and ethical behaviour across the Victorian public sector. Established the Office of Police Integrity and the Special Investigations Monitor to strengthen the role previously played by the Deputy Ombudsman. Introduced the Charter of Human Rights and Responsibilities Act 2006 to ensure human rights are valued and protected within Government and the community. Strengthened the powers of the Office of Police Integrity as the investigative body tasked with exposing police corruption and creating a corruption-resistant Victoria Police. Significantly increased the powers and resources of the Ombudsman to address issues of maladministration and allegations of corruption in the public sector. Opened up Parliamentary procedures through an annual Statement of Government Intentions and live web broadcasting of Parliamentary proceedings. Commenced quarterly release on the Internet of details of Ministerial overseas travel. Created an internet register of all Government appointments, together with rates of pay for all people appointed by Government. Copyright © 2002 - 2009 The Gov Monitor. All rights reserved. The setting was Bali. The event an international conference on fostering democracy and the rule of law. The participants, lawyers, MPs and civil servants from six countries, Indonesia, Bangladesh, Philippines, Nepal, Afghanistan and Myanmar. I was there as an invited speaker on the subject of participatory democracy and grievance redressal systems, in the context of New Delhi. Most intriguing by far was the description of a relatively new Indonesian institution — a Corruption Eradication Commission — born out of public reaction to the brazen corruption that had characterised 30 years of President Suharto’s rule when his family and cronies amassed enormous wealth at public expense. So irrepressible was the public outcry then (1998) that the incoming Government was forced to create a powerful anti-corruption agency — Komisi Pemberantasan Korupsi — as an Act of Parliament. This article dwells on KPK’s resounding success in containing corruption and some lessons for India. The KPK has already prosecuted and jailed over 100 high-ranking officials in five years. It has won every case before the corruption court and had all verdicts upheld by the Supreme Court. Indonesia says her ranking in the International Corruption perception index has improved thereby, giving the country a more ethical reputation worldwide. Among others, the KPK has jailed a Minister, Members of Parliament, heads and key officials of the Central Bank, the Election Commission, the Competition Commission, Governors and Mayors, as well as senior officers from the police and the Attorney General’s office. It has also jailed businessmen, heads of private companies and notably the father-in-law of the President’s son. KPK Commissioners are identified by a special selection team appointed by the President from among known leaders in society and representatives from the prosecution and the police. Ten candidates are recommended by the selection committee to the President, who then sends the names to Parliament which makes the ultimate choice of five Commissioners. Certainly a better way than our system where persons that occupy high office (C&AG, CVC, CBI, NHRC, Election Commissioners) are recommended (on file) only after receiving a direction from the Cabinet Secretary and the PMO after a decision has already been taken. Even when the concurrence of the leader of the Opposition is obtained, it is but a formality. Public involvement is zero and any kind of parliamentary scrutiny unheard of. Another unique feature of the KPK is the way investigators and prosecutors work in partnership and only when they both agree that there is a strong case for prosecution, is it subjected to a further review by the KPK Commissioners who ensure that the case becomes ‘winnable’. Only after that does the case get filed for prosecution which is the primary reason for KPK’s 100 per cent conviction rate. Since the KPK is headed by a five-member commission which operates as a collegium, the manipulation of the entire body becomes very hard. By law and practice, all corruption trials handled by the KPK are completed within eight months, which includes the time taken before the Special Court and the appeal before the Supreme Court. Insiders give credit to three factors for the success of KPK. First, institutional independence; second, fiscal autonomy and; third, unparalleled public support. We lack all three. But clearly the first flush of KPK’s victory is on the wane. As could be expected, two KPK Commissioners were themselves accused of corruption, something which could have finished the institution once and for all. This situation was averted only because of resounding public support when thousands voiced their protests in the streets, airwaves and the Internet. A constitutional court later found the evidence against the Commissioners to have been concocted by officials from the police and the Attorney General’s office and the suspended Commissioners are back at work. But the road ahead is now uncharted territory, with growing resistance from within the Indonesian Government’s own agencies. A watered-down version of a new corruption law is reported to be coming soon. The KPK’s continued success now depends entirely on public persistence. The KPK example carries some lessons for India. Ever since access to television channels and newspapers multiplied, scam upon scam gets reported almost daily. We have enough substantiation of corruption to warrant the installation of the grandmother of all KPKs. But the creation of a KPK and its subsequent sustenance, as the Indonesian story has shown, essentially requires sustained public demand and support, which unfortunately is sorely lacking anywhere in India. Cynicism has reached its nadir. The middle class which is the biggest votary of anti-corruption, considers it as an inevitable evil that must be endured. Most people believe that corruption will continue, no matter who is at the helm of affairs. This acceptance of wrong-doing has typified the story of the Phillipino Ombudsman which was established after corruption had inundated the Marcos regime. In the absence of public support the Ombudsman in the Phillipines has been reduced to a cipher. A clear pointer to the fact that unless people literally bring the roof down over corruption, nothing and no one within the system is going to do anything about it. Tradeable Corruption Certificates (TCC) are likely to be launched on stock markets in Asia and the Middle East today with the Indonesian Stock Market likely to be a star performer given Indonesia’s guilt-edged market performance in the sector. These innovative certificates would facilitate recovery of bribes made by foreign companies and redeploy the funds to tourists from the same country, but only when visiting the country where the bribes were received. This is intended to create awareness of corruption in bribe-giving and bribe-taking countries by motivating tourists to apply for the 50 percent TCC Discounts (TCCDs) to which they are entitled in bars, restaurants and hotels in the bribe-receiving country. Certainly the region is fertile ground. Only Singapore scores highly on the Transparency International corruption perceptions index of 180 countries, and there’s nothing to do there that's any fun. Indonesia is ranked 111th, Vietnam 120th, Pakistan and the Philippines are tied at 139th, Timor-Leste at 146th. Cambodia and Laos, conveniently situated together geographically, are tied at 158th, and so on. Afghanistan is ranked 179th of 180 in corruption, but not many tourists are interested in going there right now. If the scheme is adopted, a British flag next to the TCCD sign, for instance, would indicate that British tourists, on production of their passports, would be eligible for the TCC Discount of 50 percent, with funding recouped from those who were bribed in Indonesia by British firms. Sapta Narwindar, Indonesia’s Director General for Marketing in the Ministry of Culture and Tourism said, referring to a current promotion of “Remarkable Indonesia” which begins on 1st April in Harrods, “We hope the promotion can boost more tourists from the UK to visit Indonesia .” He told the media that “The UK is one of the most influential areas. It is also the centre of media and culture”. This is particularly germane given the fact that three British executives for Alstom, the giant French power and transportation conglomerate, were detained recently regarding possible bribes to secure contracts across the planet. Nor is Siemens, the German industrial conglomerate, pleaded guilty two years ago to paying more than US$800 million in bribes and Daimler, the German carmaker, had agreed to pay out US$185 million in bribes. An official for the Organization for Economic Cooperation and Development in Paris told the New York Times that at least 345 cases worldwide are in different stages of investigation against multinationals. According to the SFO opening statement in the UK Court and the summing up during sentencing by Justice Thomas (the British firm maintained a stiff upper lip and pleaded guilty) bribes were paid to former director general for oil and gas Rahmat Sudibyo in the Energy and Mineral Resources Ministry and former processing director at the state owned Pertamina oil and gas company Suroso Armo Martoyo. Justice Thomas said that the amount paid to Rachmat exceeded $1 million. Both Rahmat and Suroso denied the allegations according to The Jakarta Post and Suroso said “I had nothing to do with this”. The new TCC Fund could be started by contributions from the companies and individuals specified in the Southwark Court Case. These bribes were paid in connection with the purchase of lead additives to petrol and may have delayed the introduction of lead-free gasoline. This health hazards arising from lead additives must weigh heavily upon this case and may prompt the individuals concerned to get a weight off their minds by voluntarily paying into the TCC Fund. Of course the bribing company should not get their money back. In this case the benefits should go to the people of Britain and Indonesia , most of whom oppose bribery. The same principle should apply to all nations bribed by the British. Nor would the French nor the Germans. In 1968 Samuel Huntington argued that by greasing the wheels of the economy and so removing bureaucratic and other practices that impede investments and development, political corruption is efficiency-enhancing and inevitable (“Political Order in Changing Societies”). However, notwithstanding Huntington and others, national societies caught in the spiral of massive political plunder (see following table) rejected this view. In Guyana, political corruption was a major element of the opposition critique of the PNC regime. Thus, when in the late 1980’s the possibility of a PPP/C government became evident, one of the major issues on the discourse agenda was political corruption. Yet, twenty years on, not a single day passes without concerns about political corruption being expressed in our media. I thought then and I still believe that nothing will be achieved in this area until we truly understand the pervasiveness, diversity and complexity of political corruption, and the, above-tabled, level of plunder indicates that it cannot be explained, as Mr. Ralph Ramkarran has attempted to do, in terms of “increased public spending” (“Ramkarran: Not condemning PPP unless prepared to resign from it” SN 21/07/10). In my view, Mr. Ramkarran is the most worthy of the possible PPP/C’s presidential candidates, but he oversimplified the problem and unless he changes his stance is likely to fall into a similar abyss as his predecessors have done should he become president. Both nationally and internationally, by the mid 1990’s the issue of corruption had taken centre stage and many reasons are given for the change in conventional wisdom regarding it. For example, some have argued that the early failures of a purely rationalist neoliberal development economic model gave rise to the need for an expanded framework that included a necessary moral content. (Mlada Bukovansky, 2006, “The hollowness of anti-corruption discourse,” Review of International Political Economy). Be that as it may, in January 2010, the Anti-Corruption Resource Centre (www.U4.no), using World Bank data, stated that the global flow of proceeds from corruption, tax evasion and crime may well be in the vicinity of US$1.6 trillion, half of it coming from developing countries. The Centre also pointed to a recent study by Global Financial Integrity that suggests that the illicit flows from developing countries are nearly double that amount. “These figures are particularly troublesome when compared to the annual global aid flow, which is currently estimated at around US$120 billion.” It is not surprising then, that the international community and donors in particular have reached a consensus that corruption is a major problem and that the recovery of stolen state assets is critical for development. The World Bank and others define political corruption as “the abuse of public power for private benefit” and Vito Tanzi identified a gamut of direct and indirect factors contributing to corruption which is indicative of the pervasiveness, diversity and complexity of the issue (“Corruption Around the World”, IMF Staff Papers, 1998).